Powerstep from Carnation Footcare offers an immediate answer for biomechanical needs that you will be proud to prescribe straight from the pack. Developed by Dr. Les Appel DPM, a podiatrist with over 35 years experience of creating and prescribing many thousands of customised orthotic devices to relieve pain and help realign the body. 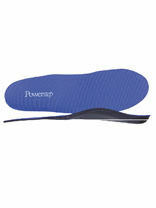 Powerstep products incorporate average dimensions obtained through computer analysis of thousands of pairs of feet.